Among the festivals of India, Holi is the only festival which celebrates love and harmony, friendship and brotherhood with various colors. The celebration of Holi is a common thread of unity in the socio-cultural diversity of India. The festival of colors is celebrated in different ways but with equal enthusiasm across the country, which will leave you surprised. Somewhere it is traditional, while somewhere it is trendy. Somewhere it is a color chaos, while somewhere it is a colorful extravaganza. Somewhere Holi is a genuine celebration of age-old folk cultures, whereas somewhere it is a sinful frenzy of urbanites. You can soak in flamboyance of colors, no matter which part of India you visit this time. We at Indian Eagle handpicked five places from across India and explored what makes them the best destinations for fun-filled, spectacular Holi celebrations. Holi is a cultural festival celebrated with an aura of sophistication in Rabindranath Tagore’s Shantiniketan, an international seat of learning and literature in Bengal. Though Holi is known as Dol Yatra all over the state, the Nobel Laureate Rabindranath Tagore introduced it as Vasanta Utsav attributing a cultural dimension to it. Dressed in shades of yellow, orange and green, boys and girls choreograph the celebration in rhythmic fashions – singing and dancing. In Shantiniketan, the atmosphere of the day is a miasma of colorfulness and literary fervor as the students of Vishva Bharati University celebrate the festival through the poems and songs, composed by the Bard of Bengal himself. Shantiniketan, which is also famous for its age-old Pous Mela, is a nearly 4-hour train journey or road trip from Kolkata. Know how to save big on flights to Kolkata, India. In Delhi, the cosmopolitan ways of Holi celebration are unique to the capital’s multicultural milieu. 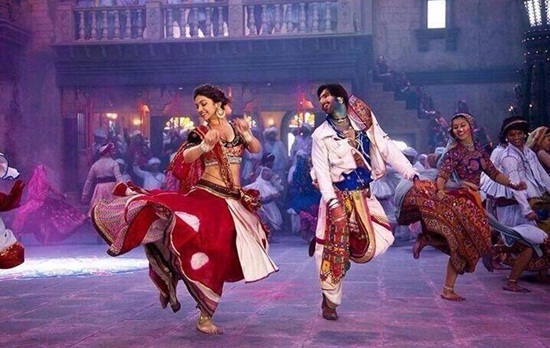 Holi celebration is not less musical and crazy than a DJ party with foot-tapping numbers from Bollywood movies. The Delhites who are Page 3 celebrities throw parties in resorts and farm houses. The temperature of the atmosphere soars so high that they cool off themselves with sips of bhang lassi and thandai. Delhi is also famous for the Holi Cow Festival, an organized event of music and madness. Do watch the video of the song, “Balam pitchkari jo tune mujhe mari” from the music album of the movie Yeh Jawaani Hai Deewani to get a hang of how madly Delhites celebrate the festival of colors. Delhi has global air connectivity. Especially, Air India operates several nonstop flights to Delhi IGI Airport from USA, UK and other parts of the world. Ahmedabad is the best place to celebrate this spring festival in Gujarat. 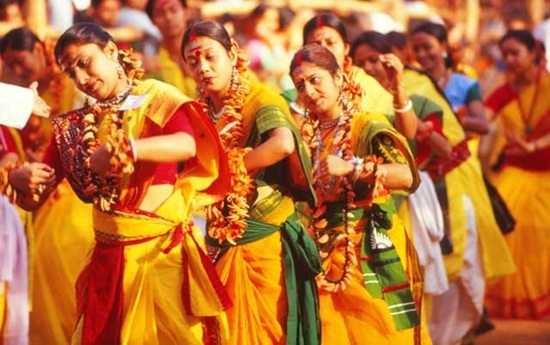 Be the festival Holi or Navratri, Gujarati celebrates it traditionally. Holi is a cultural extravaganza in the capital of Gujarat. The celebration begins with the breaking of earthen pots of buttermilk hung from a rope in the streets after the joyous procession of menfolk through lanes and alleys comes to an end. This ceremony is observed in honor of Lord Krishna who used to steal the pots of butter and buttermilk from Gopis’ houses. In some parts of the city, Gujarati belles wearing ghagra with mirror work and the men wearing colorful turbans play dandiya to spread euphoria all around. Haryana celebrates Holi in the same fashion. Ahmedabad, India’s first UNESCO World heritage city is well-connected with the rest of India. 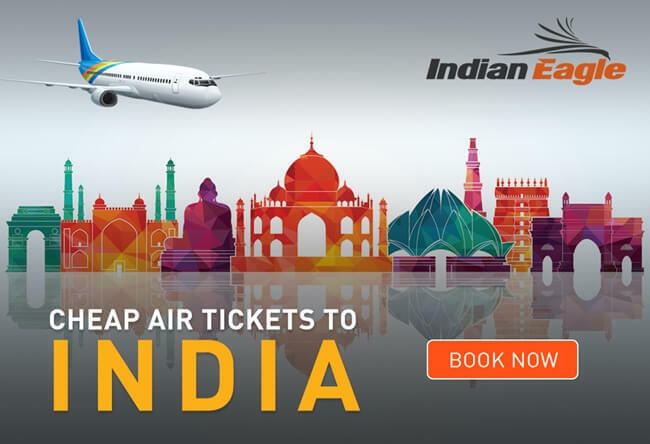 Cheap airfare deals for flights to Ahmedabad from USA will leave you amazed. Mathura and Vrindavan are the best places to celebrate Holi in North India. These two destinations for pilgrims and tourists are mythically associated with the legends of Krishnaleela or Rasleela. It is said that the zest the Brajwasis (people of Vrindavan) play Holi with is not felt in the rest of India during the festival. Their festive spirit is so high that the celebration begins 40 days prior to the day of Holi. Boys are dressed like Krishna, and girls dress themselves like Gopis (female admirers of Krishna). The Lathmar Holi of Barsana, the village of Sri Radha, is the main attraction. 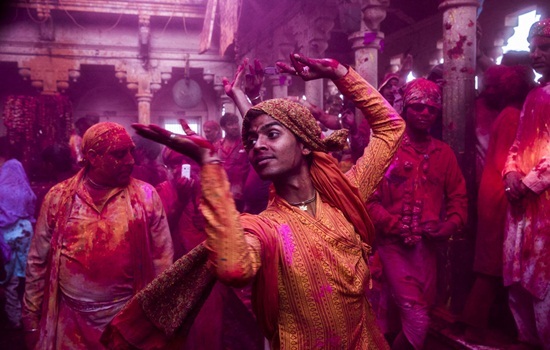 The boys of Vrindavan play colors with the girls of Barsana in a flirtatious manner. They drench each other with colored water and sprinkle gulal in the air. You can reach Mathura and Vrindavan by road from New Delhi Airport in nearly 3 hours. Check the interesting facts of the world’s tallest temple, Vrindavan Chandrodaya Mandir which is currently under construction in Mathura for a whopping cost of INR 700 crores (USD 102 million). The way Manipur celebrates the Holi Festival is culturally unique, Northeast India. The festivity begins on the Full Moon day of Phalguna and spans for six days. 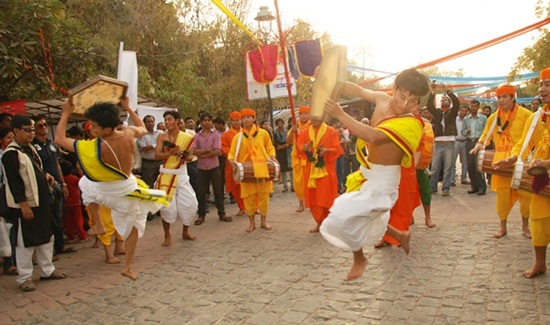 The age-old Yaosang Festival of the state was merged with Holi celebration during the rise of Vaishnavism. The tradition of celebrating Holi through cultural performances including folk dance forms and songs has been replaced with the trend – music band culture. Setting fire to a thatched hut of hay and twigs marks the beginning of the festivity. The boys and girls play gulal, the following day. The sight of devotees wearing white & yellow turbans, dancing in front of the Krishna temple and offering gulal to the obedience of the Lord is a wonderful spectacle to witness. The celebration ends with a religious procession to the capital city, Imphal. Holi is the festival which celebrates the victory of good over evil by burning holy bon-fires a night before.